"Because it means we are on our own, with no hope of aid. I'm going on, in honor of Tahu Nuva's memory and Lhikan's memory and all other Toa who came before us. Who else will join me?" Jaller (formerly Jala) is the courageous Toa Mahri of Fire and the former Toa Inika of Fire. A Ta-Matoran from Metru Nui, Jala rose to prominence on Mata Nui, where he served as Ta-Koro's Captain of the Guard and as Turaga Vakama's right hand Matoran. There he was bestowed the new name Jaller for his bravery during the Bohrok Invasion. During the Search for the Seventh Toa, Jaller was killed by a Turahk but was soon revived by Takutanuva. Some time later, Jaller mounted a rescue mission to Voya Nui, where he and his five companions transformed into the Toa Inika. Jaller led this team on a mission to retrieve the Kanohi Ignika, the Legendary Mask of Life, and during this quest the Toa Inika transformed into the Toa Mahri. Around 2,500 years ago, Toa Tuyet went on a murdering spree in Metru Nui. When the body of a Ta-Matoran victim was found, Turaga Dume instructed Jala to investigate the incident. Just prior to the Great Cataclysm, the Vahki captured Jala and placed him in a Matoran Sphere under the orders of Makuta Teridax, who was disguised as Turaga Dume. Jala was later rescued by the Toa Metru and brought to Mata Nui. Jala became Captain of the Guard of Ta-Koro and was the defender in the Ta-Koro Kolhii team. His athletic ability, devotion to his duty, and no-nonsense manner made him a logical choice for Turaga Vakama's right hand. Fiercely loyal to all Matoran and Toa, Jala did his work diligently and led the Guard to protect all of Mata Nui. He secretly wished to travel the island but understood his protective duties and often restrained himself. At some point, a Muaka threatened Ta-Koro, and it took Jala and the Guard two days to chase it off. Though Jala and his Guard managed to hold off Makuta's hordes of infected Rahi, years of incessant assaults brought much hardship for Ta-Koro. The Ta-Matoran were slowly driven away from the beach, and one costly battle resulted in the burning of a nearby forest, leaving its once-fertile trees twisted and blackened. Though the years wore on and resources grew thin, Jala remained steadfast, determined not to let the fire of Ta-Koro burn out. However, he grew frustrated by the lack of aid from the other villages' armies, knowing that all of them would fall if they did not stand together. After Takua was banished from Ta-Koro, Jala informed him of the plight in Onu-Koro. Jala was one of the first Matoran to encounter Toa Mata Tahu after he washed ashore, when the Toa of Fire accidentally sprung one of the Guard's Rahi traps in the Charred Forest. After Tahu effortlessly sliced himself free, Jala led his small band of soldiers to charge the strange tall being. Fortunately, Turaga Vakama intervened before blows could be exchanged and revealed the newcomer's identity to Jala and his company. Tahu's arrival renewed Jala's hope, but the Captain thought it unwise to rely entirely on the Toa of Fire for Ta-Koro's protection. Jala, Onepu, Maku, Kongu, Huki, and Matoro once encountered a Nui-Jaga while traveling to a Disk-throwing tournament. They managed to construct a trap for the Rahi, and Jala encouraged Huki, who had been having problems with his disk-throwing, to make the shot necessary to trigger the trap. The Rahi was successfully caught, and the six Matoran then merged into a Matoran Nui to get rid of it. The Captain made Takua a member of the Ta-Koro Guard before the Chronicler went to Ko-Koro so he could investigate the disappearance of the Ta-Matoran stationed at the Guard's North March outpost. Jala's worst fears were confirmed when Takua returned and informed him that his guards had been taken by Makuta. Nevertheless, Jala thanked Takua and later returned the favor by rescuing Takua and his company during the Rahi attack on Kini-Nui. There, under Jala's leadership, the Ta-Koro Guard helped fight the Rahi. During the Bohrok attacks, Jala and the Guard played a crucial role: by fighting the invading Bohrok all across the island, they gave the Toa time to collect the Krana needed to defeat the swarms. Late in the struggle, Jala and Takua traveled to Ga-Koro to introduce the newly-invented Boxor to the Ga-Matoran. Although the two Matoran helped combat a besieging swarm of Pahrak, the Pahrak still managed to overrun the Matoran's defenses in the dark of night. As the sun rose, Jala, Takua and the combined people of Po-Koro and Ga-Koro made one last stand against the Bohrok. They were saved when the Toa's defeat of the Bahrag disabled the Pahrak. During the following celebrations, a Ga-Matoran named Hahli approached the Captain and gave him a little flower that she was wearing on the side of her head; since that day, the two have shared a close relationship. Jala stayed in Ga-Koro for a while to enjoy the peace, but ultimately he was happy to return to his home village with his new friend, Takua. As the two Matoran returned home, another crisis soon reared its head. After speaking with Turaga Vakama, Jala and Takua noticed that one of Jala's guards was incapacitated by a cage of lightning. The culprit, Tahnok-Kal, was in the midst of stealing Tahu's Nuva Symbol from his Suva. Takua started to charge, and Tahnok-Kal shot a bolt of lightning at him. Bravely, Jala took the hit and was encased in lightning himself. Tahu arrived to stop the Bohrok-Kal, but he failed as he could no longer summon his elemental powers. After escaping his electrical prison, Jala recovered while Vakama revealed to him, Takua and a frustrated Tahu the nature of the Bohrok-Kal. Although Tahu furiously insisted that he needed no one's help, the Captain and the Chronicler followed their Toa on his trek. Jala and Takua helped Toa Tahu as he journeyed across the island, searching for the other Toa and trying to reclaim his stolen Nuva Symbol. They eventually split, and after a while, the Toa conquered the Bohrok-Kal. After the menace was defeated, Jala and Takua were the first Matoran to be rebuilt. Furthermore, as part of Naming Day tradition, Jala received the new name of Jaller for his heroic deeds. Jaller and Takua were chosen to participate in the Kolhii Tournament in the Ta-Koro Kolhii stadium. However, prior to the match, Takua disappeared and Jaller went in search for his teammate. He found Takua trying to cross a river of lava in order to reach a strange totem on the opposite side. Despite Jaller's urges, Takua was determined to reach his goal. The Matoran soon removed the totem from its place, triggering a lava flow. Takua accidentally dropped the totem into the lava, where the stone melted away to reveal the Avohkii, the Mask of Light. With the lava flow threatening to kill Takua, Takua threw the Avohkii to Jaller, who caught the mask. Then Takua began to hop back to the shore, but he was caught in the flow. Much to Jaller's relief, Tahu emerged and saved Takua from death. After a brief plummet down a cliff, Takua was reunited with Jaller. Tahu, noticing the Avohkii in Jaller's hands, told Jaller to hand the mask over to Turaga Vakama after the Kolhii match. Jaller stored the mask in his sack and the two raced to the stadium. At the end of the championship Kolhii Match, the mask slipped out of Jaller's sack as the Ta-Matoran bowed before the three Turaga present. The mask shone its light on Takua, but Takua did not want to be noticed, so he tipped the mask in Jaller's direction. The Turaga saw the mask cast its light on Jaller and mistook this as a sign that the Captain of the Guard was the herald to the Seventh Toa. Vakama asked Jaller to accept this role; annoyed and angered by Takua's trick, Jaller recommended that Takua the Chronicler come with him to record the quest. Vakama accepted, and the pair set off along with Takua's pet Ussal Pewku on a long search for the seventh Toa. The party first journeyed to Le-Wahi, where Graalok attacked them. Jaller confronted the beast using a trick he had seen Tahu use, but he failed to stop the Rahi. Lewa came to their aid, rescuing the Matoran and stopping Jaller from killing Graalok. Lewa then suggested that he should accompany the pair, and Jaller accepted this offer. The Toa of Air called upon Ka, and the group took off for Ko-Wahi. They were forced to leave Pewku behind for the time being, but the Ussal would follow them by land. They soon arrived at Ko-Wahi. There, Lewa learned from the distant drumbeats of Le-Koro that Ta-Koro had been destroyed by Makuta's Rahkshi. Shocked by the destruction of the village he had sworn to protect, Jaller wanted to return home at once, letting Takua continue the quest by himself. Takua refused, and a brief argument broke out until Lewa stated that he would leave, as he needed to join with the other Toa. Jaller and Takua then walked through Ko-Wahi, stumbling across footprints. For a time, the pair thought they were walking in circles until they stumbled upon the shells of two Kohrak. It was then they realized that they had been following Kopaka's footprints all the time. The two Matoran related their quest to Kopaka and continued their journey alongside the Toa of Ice. As they approached Ko-Koro, however, Kopaka discovered that his village had been ravaged by the Rahkshi and was quickly ambushed by the beasts. Kopaka placed down his shield and ordered Takua and a reluctant Jaller to get on. The two rode the makeshift sled down the slopes of Ko-Wahi, but they struck some rocks, and Jaller fell unconscious when he hit the icy ground. Behind them, Kopaka was blasted into the air by a shot from the Rahkshi, and he too landed unconscious. Takua, who was the only person fully conscious, woke Jaller and pushed Kopaka's shield into the lake in front of them, taking the Avohkii and trying his best to paddle away from the Rahkshi and save the mask. Kopaka awoke at that moment and froze the lake, trapping the Rahkshi in the ice. Jaller and Takua then reunited with Pewku, who had followed them all the way to Ko-Wahi. Kopaka left to attend to Ko-Koro, and the pair continued their quest. They soon entered the Onu-Koro Highway but quickly got separated. Unbeknownst to Jaller, Takua was approached by the shadow of Makuta Teridax, who threatened to kill Jaller if Takua did not surrender the Avohkii. Jaller found Takua seconds after the encounter and was both confused and angered when his friend expressed a wish to abandon the quest that should have been his from the beginning. The two forcefully parted ways, but Jaller carried on with the mask, determined to find the Seventh Toa. With Takua's departure, Jaller continued his quest alone. However, without Takua and Pewku's help, Jaller found the hike across the island increasingly difficult. A sudden earthquake almost caused Jaller to lose the mask and plummet down a hillside, but he was rescued by Takua, who had witnessed the destruction of Onu-Koro at the hands of the Rahkshi. During the raid, Takua had discovered that the Rahkshi sought the true Herald rather than the Mask of Light itself. As such, Takua quickly left to find Jaller and alert his friend of the danger. The pair continued their journey until they reached Kini-Nui, where the Avohkii suddenly shone brighter than ever before. While Jaller and Takua pondered what to do with the mask, the Rahkshi appeared and cornered the two Matoran at the Amaja-Nui. As the spawn of Makuta closed in, the Toa Nuva appeared and began fighting against the Rahkshi. They managed to defeat all the Rahkshi but Turahk, which was knocked momentarily unconscious. As the Toa were finishing their fight, Turahk awoke again and attacked the two Matoran, using its powers on Takua to paralyze him with terror. Jaller realized what was happening and jumped in front of Takua to take the blow. The Turahk's power was too much for Jaller, and he died handing the Avohkii to Takua. Devastated, Takua finally understood what he had to do. Donning the Avohkii, Takua transformed into the prophesied Toa of Light. The newly-dubbed Takanuva defeated the Rahkshi before sorrowfully picking up Jaller's body. The Makuta's words had come true: the Seventh Toa had been discovered, but at the cost of Jaller's life. After paying respects to the late Ta-Matoran, Takanuva and the other Toa constructed the Ussanui, a vehicle so the Toa of Light could travel underground and confront Makuta. Before departing, however, Hahli placed Jaller's Hau on the front of the Ussanui, saying that the Herald would continue to guide Takanuva in spirit. Hahli also stowed away aboard the craft. After Takanuva entered Mangaia, Hahli returned to the surface with Jaller's mask and rallied the rest of Mata Nui's population to enter Makuta's lair. After the defeat of Teridax and the birth of Takutanuva, Hahli was still carrying the mask when she was approached by the fusion, who used Teridax's life energy to revive Jaller. Jaller affectionately reunited with Hahli and later with the restored Takanuva, and the three helped reveal the way to Metru Nui across the Silver Sea. As the population prepared to return to their old home, Jaller helped construct boats to Metru Nui, occasionally listening to the Turaga's tales of Metru Nui with Hahli and Takanuva. Once he arrived on Metru Nui, Jaller discovered something that upset him greatly: he suspected that the Turaga were hiding something from the Matoran. The Captain of the Guard tried to question his friend Matoro, Nuju's translator who was privy to the Turaga's meetings, to no avail. Jaller then went to see Takanuva, and together they confronted the Turaga. The elders refused to tell Jaller where the Toa Nuva had gone. Jaller eventually ordered the other Matoran to stop rebuilding Metru Nui as long as the Turaga refused to tell the truth. Turaga Dume and Takanuva unsuccessfully tried to make him stop the strike. Finally, Turaga Nokama told Jaller in secret what happened to the Toa and what fate the universe would take if the Toa Nuva failed. The Captain of the Guard gathered Hahli, Hewkii, Kongu, Matoro and Nuparu and traveled to Voya Nui to help the Toa Nuva. Jaller and his fellow Matoran soon began their journey to Voya Nui alongside Takanuva, who had insisted on coming along. They traveled through an abandoned Underwater Chute and the Tunnel of Darkness to Karzahni. When they arrived they found out that Takanuva could not accompany them due to a barrier that blocked beings who bore the power of Light. After an emotional farewell, Jaller and his friends ventured inside, following vicious Manas that herded them into the valley that was Karzahni. Here they met with the realm's ruler and were forced to remove their Kanohi in favor of Karzahni's own twisted masks. Jaller originally refused, but Karzahni used his mask power to show Jaller what would have happened if he had not sacrificed himself to save Takua. In this vision, Jaller witnessed the eventual ruin of Mata Nui under the rule of the Makuta. At the end, Jaller donned his mask with his fellows. They were sent to prepare for the more Matoran who Karzahni expected to come soon. As they worked in the furnace, Hewkii discovered a tablet describing how Karzahni fixed Matoran; Karzahni was unable to properly repair the Matoran he received, instead making them weaker, so he compensated by giving them weapons for defending themselves. After returning to the furnace, Nuparu was able to slip away, finding an Av-Matoran crafter who had made the Toa Mata's Canisters. The Matoran led Jaller and his team to six more hidden canisters, and they managed to escape with them. When the Matoran reached Voya Nui, six bolts of lightning from the Red Star above transformed them into Toa before they exited their Toa Canisters. After being transformed into Toa, Jaller and his fellows entered a cave on Voya Nui. There, the Toa made several strange discoveries about their new forms: their Kanohi were now organic, and their faces gave off a blindingly bright glow. Here they also discovered the mask powers of Kongu and Nuparu. Soon, the Toa Inika set off on an expedition, hoping to find clues about the Toa Nuva's location. Eventually, they came across the Piraka Vezok; a battle raged, and the Toa won while Vezok escaped. The Inika met with the Voya Nui Resistance Team, and they learned about the Piraka and the Toa Nuva's possible whereabouts. As a result, the Toa and Matoran split into teams. Matoro, Hewkii, Kazi and Balta sought out a being who turned out to be Axonn; Kongu, Nuparu, Velika and Garan set off to attack the Piraka Stronghold; and Jaller, Hahli, Dalu and Piruk left with Zamor Spheres filled with Energized Protodermis to free the enslaved Matoran who were draining the lava from Mount Valmai. After their jobs were complete, the Toa and Matoran headed off to the Piraka Stronghold. There they re-united and a battle between the Piraka and the Toa Inika began. The battle was abruptly ended when Hakann and Thok used a special Zamor Sphere to drain Brutaka's powers. The other Piraka and Toa were knocked unconscious, save Nuparu and Zaktan; the Toa of Earth returned after plunging the Skakdi into the sea. The Inika and the rest of the Piraka soon struck a deal and were given assistance by Axonn, who gave Jaller a special Zamor Sphere that could create stasis fields. The remaining Piraka and Inika advanced onto where Hakann and Thok had gone. An explosion created by Hakann let them know where the two were. The Piraka separated from the Inika and decided to approach the two traitors from another way, for their own reasons. Zaktan was first to find Hakann and Thok. Immediately, a lengthy battle ensued. By the end, Brutaka regained his powers, and no one on the battlefield save Zaktan was left conscious. When the Inika awoke, they realized that the Piraka had ventured down the 777 Stairs where the Mask of Life was hidden. The Toa followed suit. As they walked down the staircase, the Inika encountered Lhikan, who was an incarnation of the Mask of Life. After the Toa conversed with him, they continued down the staircase. In the Toa Inika's first challenge, the Toa had to face their fears. They encountered a Muaka, Nui-Rama, Bohrok, Bohrok-Kal, Rahkshi, and Teridax. Jaller fought against a Turahk, and when he tried to create a wall of flame, the lightning of his fire jolted the Turahk and killed it. The Inika put up a valiant battle and managed to kill each of their opponents by accident. It was then that their opponents turned into none other than the Toa Nuva. Shocked by the fact that they had killed their heroes, the novice Toa Inika wondered if they should go on. After deciding to go, the illusion of the Nuva disappeared: it had been a trick after all. After the battle, the Toa Inika entered the Chamber of Death. The voice of a Great Being told them that if the Toa wanted to descend further, one of them had to die. Jaller heroically volunteered to die, but the memory of his death on Mata Nui stopped him. Matoro stepped up instead, saying that he had nothing to offer for the team and was therefore the best choice. Before the Inika could argue, Matoro had already begun to disintegrate. After a few minutes, Matoro was rebuilt, and the voice said that it did not matter if one died—rather, it mattered if one was willing to die for their cause. The Inika moved on and encountered a group of bizarre Rahi known as the Protodax. After the Toa fought a losing battle, Umbra stepped in and stopped the Protodax; the brutal creatures were intended to stop Rahi from reaching the Mask of Life, but Umbra himself dealt with sapient beings. The Inika fought with Umbra and barely made it to the bridge leading to the Mask of Life. The Piraka put traps there, but the Inika fought on and made it to Vezon and Fenrakk. After a lengthy battle against them and the Piraka, during which Fenrakk was transformed into the Kardas Dragon, Jaller fired the Zamor sphere Axonn had given him and froze Vezon and Kardas in time and space. Matoro used this opportunity to retrieve the mask. However, the effect of the sphere quickly wore off, and Kardas unleashed a blast of energy that knocked the mask out of Matoro's hand and sent it flying up the stairs and into the ocean. The Inika attempted to find the Ignika, but they were unsuccessful. They met up with the Toa Nuva, and after speaking with the heroes for a while, the Inika traveled down the Cord that led to Mahri Nui. On the way they fought a tribe of Zyglak as well as Teridax, who briefly possessed Matoro's body. When the Toa Inika reached Mahri Nui, the Ignika emitted an energy blast as a cry of help. This blast transformed the Inika into the water-breathing Toa Mahri. After some investigating, the Toa found the underwater city of Mahri Nui. To earn the Matoran's trust, the Toa had to free the city's supply of air bubbles from attackers. While Matoro stayed behind to talk with Defilak, the leader of Mahri Nui's council, Jaller and the rest of his team went to help free the Fields of Air. At this point, Jaller was already slightly annoyed with Matoro for taking more control over the team. As soon as they arrived, the Toa Mahri were intercepted by the Barraki and their armies of sea creatures. The Barraki took the five Toa to a series of sea caves and then departed. Although Pridak insisted that the Toa were "guests," the creatures of the deep guarding their caves made it clear they were not supposed to leave. While the other Toa hastily made their escapes, Jaller headed over to help Kongu. During that time the heat and light from Jaller's Aquatic Power Blade attracted a Hahnah crab which would continue to follow him for most of his undersea mission. Jaller suggested Kongu use his mask to summon a creature, but the Toa of Air refused; he feared the mask's power. Finally growing fed up, Kongu unleashed an underwater cyclone and scattered the rays guarding him. The Toa were then attacked by two of the Barraki, Carapar and Kalmah, who had come to check on them. Kongu was hit with a life-draining Sea Squid and was quickly pushed out of the fight. He would have died if not for the Hahnah Crab that was following Jaller. It leaped onto his back and killed the squid, giving Kongu enough strength back to use his mask. He summoned a monstrous, 200 foot long sea creature from an age when it was dwarfed by its fellow beasts. The Barraki quickly retreated, and the beast became locked in combat with the revived giant Venom Eel. The two Toa quickly departed to avoid the conflict. On the way back to Mahri Nui, Kongu and Jaller ran into Hewkii, Nuparu, and Hahli. They had just been in Hydraxon's armory and had found a load of multi-barreled weapons called Cordak Blasters. Jaller remained as the leader of the Mahri throughout the mission, but he felt irritated that Matoro was taking some control because he was destined to hold the Ignika. He was also a bit frustrated that Hahli, being in her own element, continually set out alone on missions. Matoro warned the other Toa that to continue their mission they had to destroy the Cord, which was tethering Voya Nui in place on the surface of Aqua Magna. Jaller and the other Mahri evacuated the Matoran of Mahri Nui up the Cord, where they met with Axonn and the Matoran of Voya Nui. The Matoran could find shelter in Voya Nui's underground caverns while the island sank back to its original location in the Matoran Universe. Axonn also provided the Mahri with a Toa Terrain Crawler to assist them. At that point the Mahri headed down the Cord in the Toa Terrain Crawler and a major conflict broke out between them, the new Hydraxon, Gadunka, Maxilos, and the Barraki. During this conflict, Jaller was able to obtain the Mask of Life and passed it on to Matoro. The Mahri then used their Cordak Blasters to destroy the stone Cord, and Voya Nui started to descend back down to its dome. Voya Nui smashed Mahri Nui into rubble as it sank. Meanwhile, the Barraki were still in pursuit of the Toa Mahri, who were racing to make it beneath Voya Nui before the island fell back into the Matoran Universe. During the Mahri's frantic descent the Mask of Life went dark, signaling that the Toa had failed—Mata Nui was dead. Matoro decided to follow Voya Nui, believing that something could still be done to revive the Great Spirit. Jaller told Matoro to continue ahead without the rest of the team, who would prevent the Barraki from catching him. Believing that the five remaining Mahri were going to lose against the Barraki, Jaller decided to perform a Nova Blast, which would kill the Barraki as well as all the other Toa. Before Jaller could release the devastating blast of energy, Matoro used the power of the Ignika to teleport Jaller and the four Mahri to Metru Nui and granted them the ability to breathe air. Once on land, Jaller had to suppress the Nova Blast so as not to harm Metru Nui. Vakama then approached the Toa Mahri and explained to them what happened to Matoro—he had donned the Mask of Life and died to save Mata Nui. After Matoro's death, Jaller and the other Toa Mahri assisted Takanuva in defending Metru Nui. Together, they defeated the Kardas Dragon, which had ventured down from Mata Nui. Later, Jaller stayed behind when his teammates went to look for the missing Takanuva, still troubled by the death of his comrade. When the other Mahri returned, they encountered the Toa Hagah, who told them that they had come to destroy the Coliseum. The Toa Mahri attacked the Hagah, believing them to be impostors. The teams fought to a stalemate but were forced to band together to stop a giant Rahi accidentally released by Kualus. The teams forged a truce, and the Hagah further explained the reasons for their sudden appearance and their need to get underneath the Coliseum. The eleven Toa then worked together to lift the Coliseum, with Jaller helping Norik, Nuparu, and Pouks make a tunnel leading underneath the ancient structure. Jaller wanted seek out Teridax with the Hagah, but Norik convinced him that Toa Mahri would be best off staying outside as a last resort should Teridax escape. Jaller then watched the six Toa seal the tunnel behind themselves, commenting grimly that he had never seen anyone seal their own tomb before. Later, the Order of Mata Nui gave Jaller and his team the Heart of the Visorak so they could summon the Visorak horde to the island of Artidax. Jaller decided to bring Hahli and Nuparu with him to Artidax while Hewkii and Kongu stayed behind in Metru Nui. The three Toa Mahri departed by ship to the far south and eventually arrived at Artidax. Once they arrived, they discovered several sets of tracks, at which point the Barraki Takadox revealed himself. After the Toa Mahri explained their presence, Takadox slowly used his hypnosis on the three Toa and took their boat to escape, leaving them trapped on the island. After the Visorak had arrived on Artidax, Teridax telepathically communicated with Jaller, who was still in Takadox's trance. Teridax soon forced the Toa of Fire awake and taunted him, claiming that the Makuta would enjoy the look on Jaller's face when he learned the truth. Jaller, now fully conscious but unable to recall what had just happened to him, hurled fireballs at both of his teammates to revive them. After a swift discussion, the Toa chose to swim to avoid being destroyed by Artidax's volcano. Fighting his way into the sea, Jaller had a slight idea to destroy the heart as it was against the Toa Code to purposely kill. However, Jaller's sense of justice soon seized him, and the eruption of the volcano destroyed the Visorak. He and his comrades then began swimming back to Metru Nui. When they arrived on the shores of Metru Nui, Jaller and his teammates found that the city was under heavy attack by an army of Rahkshi. Using their elemental powers, the Toa Mahri trampled through the Rahkshi forces so that they could reach the city's high walls. They found Vakama, who informed the Toa of what had happened. During the battle, Mata Nui was awakened thanks to the actions of the Toa Nuva in Karda Nui. However, unbeknownst to all, Teridax immediately took over Mata Nui's body. The arrival of the Toa Nuva at that point, along with a storm created by Teridax and a small force of Bohrok awakened by Toa Krakua, helped to win the battle. At some point, the Toa Nuva likely returned Lhikan's Hau to Jaller. The next day, Turaga Dume announced a city-wide celebration of victory and of the awakening of Mata Nui. Jaller attended the festivities along with the rest of the Toa Mahri and the Toa Nuva. It was during the celebration that Teridax revealed himself to be in control of the universe. The Toa Mahri gathered together once more for a mission given by what was left of the Order of Mata Nui. The heroes journeyed to a Skakdi base on Zakaz to discern whether or not other warlords were following Nektann's lead in allying with Teridax. After Hewkii and Kongu took care of the base's guards, the Toa found an underwater river that transported them to a Skakdi assembly. They watched as the Skakdi dropped a Zyglak, a Vortixx, a member of the Stelt labor class, and the five remaining Piraka into an Energized Protodermis tank. After the beings fused together, the Golden-Skinned Being emerged from the tank and demanded a meal. The Skakdi eagerly mobbed around it while the Mahri prepared to act. However, the fusion made the Skakdi's dreams real, and the Toa Mahri were soon entranced by its power. Jaller and the other Mahri dropped their weapons and headed towards the Skakdi to offer their servitude. After Teridax was defeated, Jaller and the other Toa Mahri left the Matoran Universe with the Skakdi and the Golden-Skinned Being and arrived on Spherus Magna. The troop traveled to the coast of Aqua Magna, where the fusion created and took up residence in a vast fortress. Shortly afterwards, Annona attacked and consumed the dream energy of all the Skakdi in the fortress, driving them mad. The Golden-Skinned Being's power automatically granted the maddened Skakdi's dreams, causing the fortress to dissolve and aberrations to appear in the region. During the confusion, the fusion's hold on the Toa Mahri was broken, and Jaller was released from his trance. In this alternate universe, Toa Jaller was being urged by an alternate Kiina to hurry up with repairing a metallic shelter when Vezon arrived in Tesara. In this alternate universe, Jaller remained a Ta-Matoran and was fiercely loyal to the Toa Empire. Jaller still wore his red Komau as he never left Metru Nui and therefore did not break his Kanohi in a Matoran Sphere. Jaller was sent on an expedition to Artakha with Toa Kualus and Bomonga to retrieve the Kanohi Vahi and bring it to Metru Nui. Teridax, Kojol, and Krika sent Takanuva to kill Jaller's party and retrieve the Vahi in return for smuggling him out of the city. After Takanuva joined the caravan, the group passed through Karzahni and continued on to Metru Nui. While in Karzahni, Lesovikk attacked the group and used a gust of wind to blow the Toa out of the way. After knocking Jaller unconscious, the Toa of Air stole the Vahi. In this alternate universe, Jaller helped defend the escaping citizens of the Matoran Universe from the Makuta. When Rahkshi killed Pohatu and Hewkii, Jaller, Tahu, and Kopaka drove them back. Jaller spends most of his time in the rebuilt Great Furnace on Mata Nui. When Takanuva arrived in the Kingdom, he asked to be taken to Jaller. Jaller answered a few of Takanuva's questions before directing the Toa of Light towards the nearest Wall of History so he could learn more about where he was. Even as a Matoran, Jaller possessed a strong sense of right and wrong. He was willing to admonish even his authorities, such as Toa Tahu and the Turaga, when he recognized an obstruction of justice. Jaller tries to exercise a more cautious leadership style than other Toa of Fire, such as Tahu or Vakama, have been known to use. He maintains the dutiful, loyal attitude he bore as a Matoran, and tries hard to heed the opinions of his teammates as well. Nevertheless, Jaller grew annoyed when Matoro began taking charge of the Toa Mahri in the Pit, though the two did eventually resolve their differences. As a Toa Inika, Jaller could create, control, and absorb the element of Fire; however, the fire that he produced was intertwined with Lightning. The irregular amount of energy Jaller's body contained caused him to glow and made him immune to the effects of Antidermis. When he became a Toa Mahri, Jaller lost his lightning abilities and Antidermis immunity but was granted the ability to breathe underwater. 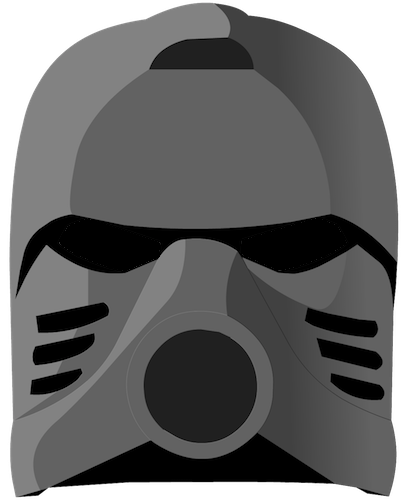 He also lost his ability to wear regular Kanohi, as his modified Kanohi was necessary for breathing. When Matoro teleported Jaller and the other Toa Mahri to Metru Nui, he made them amphibious as well, allowing Jaller to wear regular Kanohi on land. Jaller wore a powerless noble Komau in Metru Nui, Turaga Lhikan's Noble Hau on Mata Nui, and a powerless Calix for a brief time in the realm of Karzahni. Lhikan's Hau was taken by Karzahni when Jaller received his Calix, but it was later retrieved[TNB, Ch. 7] and likely returned to him by the Toa Nuva. In his time as Captain of the Ta-Koro Guard he wielded a variety of weapons, including a Bamboo Disk, a two-pronged spear, and a small dagger. As a Toa Inika, Jaller bore the Kanohi Calix, the Great Mask of Fate. The mask let Jaller perform at the absolute peak of of his physical abilities; using the mask Jaller could, for example, execute leaps and dodges others might think impossible. Jaller wielded twin Energized Flame Swords as well as a Zamor Launcher filled with Energized Protodermis Zamor. Jaller has been released four times as a set. His first release was in September 2001, when he was one of the original six "Tohunga" released through McDonalds Happy Meals in North America. He featured eight pieces, including a Hau-patterned Bamboo Disk which one could fling by pulling back and releasing his right arm as he held the disk. Jaller was later given a worldwide release in 2003, in the larger rebuilt Mata Nui Matoran form, as part of the set "Jaller & Gukko". With the Gukko, the set contained 221 pieces. In this set Jaller wielded a Kolhii Stick and Kolhii Ball. In summer 2006, Toa Inika Jaller was released as a canister set with forty-six pieces. As a set, Toa Inika Jaller is one of the only two Inika (himself and Matoro) to have transparent joint pieces. His set came with one Energized Flame Sword despite the story giving him two. He featured four sea-green Energized Protodermis Zamor spheres, although in the story these would have been silver. In a Nestle promotion in 2006, Jaller was released as a small promotional set under the name 6992 Red Toa - Jaller. It consisted of 3 pieces which, unlike most other promotional items, were compatible with LEGO pieces. Jaller was released once more in summer 2007, this time as a sixty-eight piece Toa Mahri canister set. In this most recent set he was accompanied by a Hahnah Crab that held his Cordak blaster on its back and was connected to Jaller's right hand by a chain. Toa Mahri Jaller featured nine Cordak mini-rockets, six of which were stored in the barrel of his Cordak blaster, ready for use, while the other three were stored on his back. Jaller appeared in minifigure form in 2006 in the 8892 Piraka Outposts, 8894 Piraka Stronghold, and 8624 Race for the Mask of Life playsets (the last of which is non-canon), and in 2007 in the 8926 Toa Undersea Attack playset, and the 8927 Toa Terrain Crawler. In his 2007 minifigure he wore a recolored Kanohi Garai, since a minifigure Arthron was not made for that year. Toa Inika Jaller was also part of McDonald's BIONICLE "Happy Meal" promotion in 2006. The Jaller toy's Zamor Launcher instead fired disks bearing Jaller's name and image when a button on top was pressed. "You can never have too much security." "Danger is the anvil on which trust is forged." "Nothing gets past the Captain of the Guard ... unless he wishes it." "Fine, but I won't give up. I'll find the Seventh Toa whether you're the true herald or not!" "You Piraka have a choice... Leave the island on your own or we'll throw you off. Go on your own, and you can live out your long, rotten lives. Make us do it -- and there won't be enough of you left to feed a Makuta Fish." "Tahu told me something once, not long after he first arrived on our island. He said having real courage doesn't mean being unafraid of death - it means you keep on striving for what's right despite your fear." "Times like this, I could really use a Mask of Shielding. Before all is said and done, I am going to get my old mask back -- the one Karzahni took from me -- even if I have to go back there by myself. It dishonors Lhikan's memory just to let it be lost. Plus, I am really, really, tired of dodging." "We didn't come all this way ... fight all these fights ... just to lose." "Give it up, or some lucky Rahi will be having boiled Barraki for dinner." "We all live in this universe. That means saving it is everyones job." Jaller is voiced by Andrew Francis in Mask of Light. Jaller is the only known Matoran to have worn a powered Noble Kanohi. Jaller's Noble Hau was in the shape of a Great Hau. The prototype set of Toa Inika Jaller had two Energized Flame Swords, a trait which was reflected in the story even though Jaller's final set only wielded one. This page was last edited on 16 March 2019, at 05:12.